Polishing work is divided into two stages, firstly, shaping (SHITAJI), and secondly is finishing (SHIAGE). In other words, base work and final work. Finishing work (shiage) can be completed in two styles. One is the modern style (HADORI or KESHO), the other is the classical style (SASHIKOMI). The word "KESHO" means a make-up of lady's face. It is designed to highlight the aesthetics of the blade. In this style polishing, the hamon appears white against the black, shining steel and the mirror finished shinogi-ji. It is so aesthetic that it makes a blade perfect for display. The white pattern that looks like hamon is called "HADORI". It is not a true hamon, but it is designed by polisher along the hamon to exaggerate it. When you look at the blade under a proper light, you can see the true hamon under the hadori. However, sometimes this "make-up" can cover flaws in a blade and it can hide the subtleties within the steel. With the modern polishing style, you can see the blades with aesthetically "made-up face". One more example of the modern style polishing. "Is this hamon pattern NOTARE (wave)?" "No, it is not a wavy hamon. It is choji. But the hadori is wavy pattern." It leaves the color of the steel more natural. The blade looks dimmer than one polished in the modern style, but when you look at the blade under a proper light, you can see the true color of the steel and everything comes up very honestly. In other words, the classical style shows more the true nature of the blade , its glories and its flaws. The integrity of this style of polish is a necessity for truly studying the blade. This type of work can only be done with natural stones. This blade has a fine steel and very bright hamon line. All the characteristics are brought out in a very natural way. One more example of the classical polishing style. This blade has a fine steel and a good signature on the tang, but unfortunately, the hamon is a little dim. The hamon color is original, as it is wide enough and the blade doesn't look "tired". In the classical style polishing, the hamon is not enhanced so we can see its' true color. This dim hamon means a little lower edge holding than the bright one. It is this clarity of polish in the classical style that allows us to determine the hardness of the edge. On such blades, the modern style polishing may be better for BUSINESS! The modern age has seen the rise of "Acid" polishing. 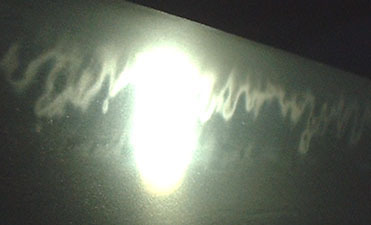 This form of polishing uses various acidic compounds to artificially expose the blade structures. It is used in both Modern and Classical Style finishing and I cannot stress how deplorable I find this technique. On shinogi-zukuri blades without grooves, the shinogi-ji is rubbed with needle to get a mirror finish. The rubbing work ends at the lower part of mune-machi. Sometimes we find lines below there. We call it "NAGASHI". The polisher extends the rubbing work toward the tang as several lines to show his skill. Straight and parallel lines suggests his good skill. Nagashi is put also on the back of kissaki. Each craftsman has his own style of nagashi, so it can be a meaning of signature, like bar-code. Good nagashi is elegant, but difficult to make by poor skill. Such a work is not necessary to make a good polish. Sometimes it is just a trouble to study blade. So some craftsmen don't make that.